OptionStars is one of the brokers that does its best in trying to maintain a great reputation and providing high-quality services for its traders. We should mention that OptionStars is licensed by CySEC, one of EU most prominent regulatory bodies. This characterizes it as a serious binary options broker that fulfilled all the requirements and is doing its best to serve traders. This review is written for all traders out there to get a closer insight into the activities of the broker, who grows in popularity. Can this broker be trusted? Find out more about it here. Binary options trading has shaped into a serious business and is meanwhile obtaining acknowledgments as deserved. Brokers extend their business to include binary options services, traders quickly became great options fans, and regulatory bodies had to provide rules and regulations for this type of trading as well. OptionStars wants to provide the best possible service to its clients and by offering different account types, the broker tries to match the experience levels of different trader target groups. Looking at the minimum deposits for any of the account types traders realize that this broker is more oriented towards experienced traders. Even if the broker offers a demo account, it cannot be accessed without the initial deposit. If a trader should register with the demo, despite the high sum, they have to send a request to the account manager for approval. Once you are approved, you get $5000 of virtual money to start practicing your trading skills. Bonuses have been part of the binary options market since forever, and they attract many traders. OptionStars provides two types of bonuses to cheer up their clients. There is the Pending Cahs Bonus and Proportional Bonus. When traders reach the pre-set volume, they qualify for the Pending Cash bonus. They get a call from the broker who informs them in advance on how the funds can be utilized. Several requirements need to be met before the trader is eligible for withdrawal. The proportional bonus refers to a particular bonus, and as its name suggests, the bonus amount can vary. In every trade that follows, the deposit money and the bonus money the trader uses for trading is reciprocal to the deposit and bonus amount. In order to qualify for withdrawal of the bonus certain criteria must be met, like a 20x trading turnover. Other criteria are listed in the Bonus Terms and Conditions which explain the whole process in detail. We kindly suggest reading the bonus policy of OptionStars in order to know what steps have to be taken to qualify for withdrawal, as well as to apply for a bonus. Auto trading is also one of the sophisticated features offered by OptionStars. Tradologic is the binary options platform which is included in the service package of this broker. Tadologic is a very well-known platform in the binary options world and comes with all necessary features and options. The platform is highly safe and enables traders to enjoy a safe and protected trading environment while they trade in stocks, currencies, commodities, indices, and much more. The platform offers different expiry time ranges so traders are free to place short and long-term trades. The Tadologic platform is user-friendly and easy to navigate. The clear interface makes it easy for traders to find all relevant information. The different sections are lined up at the top of the OptionStars website. As a high-quality broker, OptionStars uses SSL encryption of course to provide the highest level of security of its customers and their funds. Instruction on how to keep your account safe from hackers is also provided. The trading platform is accompanied by a mobile version for all those who cannot stay away from trading even when on the go. For purposes of the review, our team performed a customer support test by contacting the support staff. The customer support provided all necessary and relevant information we asked for. moreover, the employee was very polite. The customer support can be reached via email, live chat and an online form which is displayed on their website.Live chat is the most convenient form for the majority of traders. It proved to be the most efficient. The OptionStars website is available in seven languages. Those are English, Spanish, French, Russian, German, Italian, and Arabic. If the traders want to enhance their knowledge, this broker provides many learning resources which are available in the Academy section. Some of the topics available are news and market analysis, technical analysis, strategies, etc. The Academy section consists of two parts. The first part is the Binary e-book. The first is Binary V.O.D. , Economics Advanced Course, which is further divided into beginner videos and videos for experienced or advanced traders. There, traders can find different information which can come in handy in their trades. OptionStars is based in Cyprus and operates under the Novox Capital Ltd company. As we said, the broker is registered with CySEC under no 224/14. All brokers registered with CySEC can be found on the CySEC website. Also, CySEC keeps reports on the business conduct of the brokers. We came to find out that only two payment methods are accepted by the broker. Credit cards and wire transfers are the two possibilities to deposit and withdraw money. But, the broker did announce an introduction of other payment methods as well. After careful research, we found out that the minimum amount for withdrawal is $30, even if the FAQ section claims that there is no limit on withdrawal. Every trader has the right to withdraw funds for free once a month, while each following withdrawal in the same month is charged with a $30 fee. The traders have to verify their account when they want to withdraw their money by sending relevant documents. The withdrawal process takes 5 days on average. If the trader fails to submit the requested documents within 7 days, the withdrawal request will be canceled. 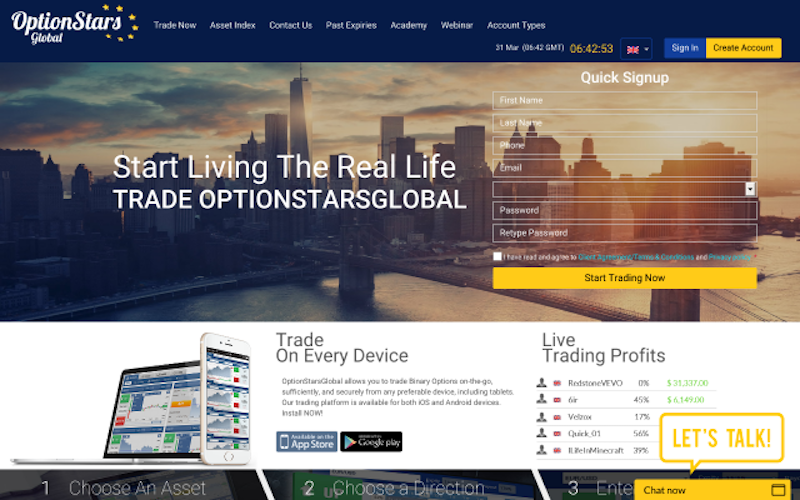 7 Binary Options Review: OptionStars : 4.5 stars.